Hardy in zones 4-9 Prefers full sun Hieght: 18-24 inches Easy to grow Size shipped: 4" pot, current size at shipping is 4-10 inches tall. Crimson Pygmy' (syn. atropurpurea 'Nana') Dense, low spreading, compact form and dark burgundy foliage. Smaller, dwarf version of the original Red Barberry. Nice dark blood red leaves keep their color all the way from spring till frost. Has a neat, compact, round growth habit. Makes an excellent foreground plant, or for use as a smaller, lower growing border / edging planting. Makes a great little low growing "barbed fence" when planted in hedge type applications ( approx 2-3 ft apart ). Maintains a generally rounded, globe shape naturally, but looks especially nice & neat if kept trimmed throughout the growing season. 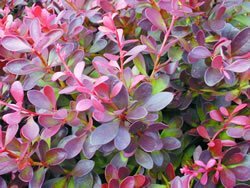 Burgundy red color is best displayed in full sun planting locations....will fade to green with touches of burgundy in shady spots, or locations with less than adequate sun exposure. Fall color is more of a bright red than burgundy, with leaves eventually falling off in late fall - exact timing will vary depending on just what part of the country you are in.